Zoning compensates for the effects of heat rising in mutli-level offices, for overheated rooms (such as computer or telephone/equipment rooms), and for heavily occupied rooms. Zoning an HVAC system allows the ability to have a thermostat for every room. Even in a large room, multiple thermostats could be used to provide some variation in temperature for multiple uses, or to compensate for a variety of internal loads or building orientations. 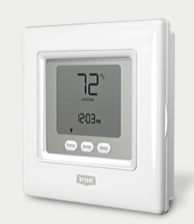 Providing individual temperature control in each area, the ability to manage the heating or cooling of individual rooms by use, the ability to adjust individual room temperatures for individual preferences, and the choice to close off airflow in rarely-used rooms, reduces energy usage. Zoning can also save on the installation cost of multiple-unit systems and on maintenance costs and utility bills. Our engineers are well equipped to evaluate your space and design an efficient yet economical system that will be more than sufficient for your needs.